The Bobgans are foremost experts in the field of psychology and psychological integrationism. 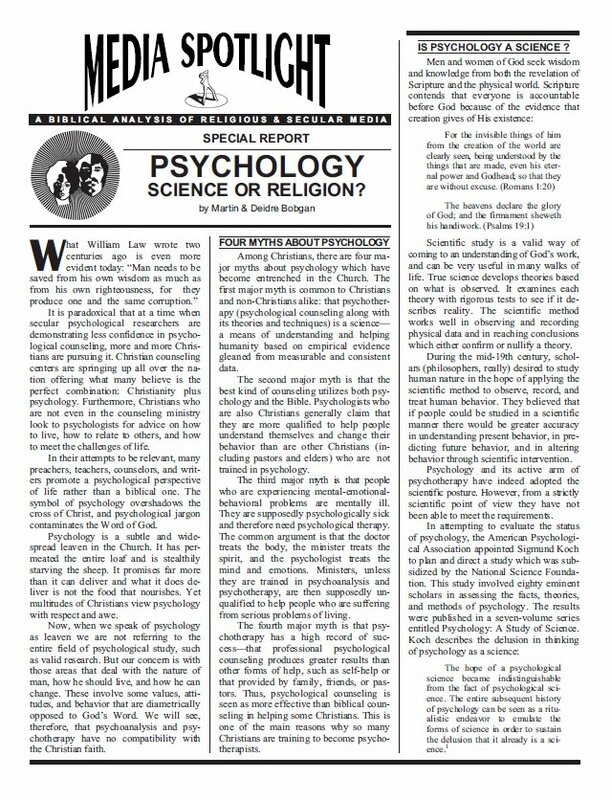 This authoritative report, based upon their book, PsychoHeresy, reveals that psychology is really a religious system that is diametrically opposed to biblical faith. Learn the four major myths about psychology, which poses as a science. This is one of the most important issues facing the churches today. Many churches today are buying into the four-temperament theory in attempts to determine where their congregants' spiritual gifts lie. Because Christian bookstores carry numerous books on the subject, authored by well-known and respected personalities within the Christian community, it is assumed that there is no problem with incorporating such ta theory into a church's assignment of ministry to individuals. This study reveals the source for the four-temperaments theory to be astrology. It was incorporated into psychological theory by secular psychologists within the past hundred years, and found its way through psychological integrationism into the churches. Thus, tests to determine spiritual gifts are often based upon this psychological theory, and reveal not spiritual gifts but natural talents. This is a must study for all Christians.